So you’ve struck out on your own: You’re following your dreams and controlling your destiny by starting your own brokerage. Now it’s time to set up healthy systems and routines, develop consistent and effective branding, and find strategies for generating company leads. You will also find resources for staying up-to-date on the legalities of running a brokerage, tips for hiring and recruiting, and ways to keep your finance in check. Learn how to develop office policies that speak to the culture you’re building, find out how other brokers overcame some of their toughest problems while starting a new business, and get advice on everything from advertising on social media to establishing a wellness program. U.S. Small Business Administration — This website should be the first stop for anyone wanting to start a business. Topics covered include startup basics, writing a business plan, financing, marketing, employment, and tax topics. This site also has special areas for women business owners, veterans, minorities, Native Americans and young entrepreneurs. You can also find a local SBA office for further assistance. SCORE Association — As "Counselors to America's Small Business," SCORE provides counseling for would-be entrepreneurs through email and confidential one-to-one meetings. 389 chapter offices provide this free service. SCORE's website offers free e-newsletters, online articles, quizzes, tips and a business toolbox. Entrepreneur Magazine — From choosing a business structure to naming your business, this website highlights the nitty-gritty basics of business star-ups. How-to guides, online newsletters and a resource center of articles provide helpful information for your start-up. Inc.com — Inc.'s website provides information on starting, growing, and leading your business. A highly interactive course designed to help refocus the student’s business plan to a customer service centered, repeat and referral business. This course highlights both traditional and digital approaches to identifying and closing more customers. In this course, you solve real estate issues using a learn-by-doing approach. If you’re a real estate agent or someone who generally enjoys dealing in real estate, then you may just like owning your very own real estate agency. Start-up costs are inevitably high, validity in the marketplace is still largely undetermined and people question if the business will take off. Using the resources of this site, you'll find help starting your new brokerage, setting up your business systems and growing it for an exit strategy. This course will teach you how to think about the business of your business and make it more profitable and you more successful. This course will provide you with the skills to create an executable personal business plan, a value-add report, and a quality marketing proposal. 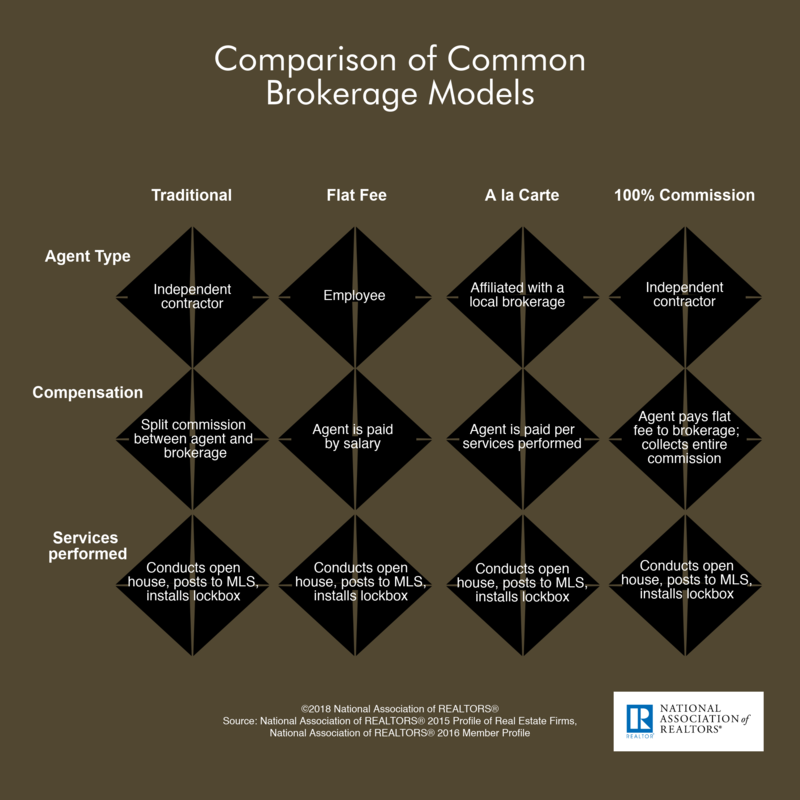 This infographic shows common brokerage models, compensation structures, and other details of brokerage firms.